There is a 22-minute video done for Memorial UCC’s centennial in 2017 that is available here. As Madison entered the year 1917, it was in the midst of one of the great transformations in its history. A new state Capitol building was being completed, a new meatpacking plant had just opened on the east side of the city and new battery plant opened on Winnebago Avenue. The city council petitioned the Legislature to give women the right to vote in school elections and the number of cars in the city had just surpassed the number of horses. People from the area – including Swiss people from Green County – were migrating to Madison for expanding job opportunities. Many of them had grown up at Swiss Church in New Glarus, founded in 1840, the state’s first German Reformed Church. Two great social debates were underway. On April 3, Madison voted to ban all saloons and become a “dry” city. On April 6, President Woodrow Wilson took the United States into World War I, a move that roiled the waters in this city where a quarter of the population was of German ancestry. The debate over the war divided the city and by the end of the year had given birth to a new newspaper, The Capital Times. This was the context in which Memorial United Church of Christ was born. But it was also born out of ethnic and denominational differences. The Swiss who moved up to Madison initially attended St. Paul’s German Presbyterian Church, which was located at the corner of South Webster and East Washington, where the state’s GEF-1 office building now stands. It had its roots going back to about 1845, built with lumber from the oak trees on the Capital Square. It was started by the Presbyterians to help German immigrants transition slowly into the mainstream of the denomination and the nation. As the Reformed Swiss joined with the German Presbyterians, they formed a community of about 75 members by 1916. But the Swiss were unhappy. Amalie Kindschi was one of those who had been attending. She described herself as “very unhappy” with the German Presbyterian Church and longed for another Reformed Church. She was not alone. In early 1916, the pastor of Swiss Church – Rev. G. D. Elliker – asked Rev. Josias Friedli, head of the Board of Home Missions for the Reformed Church in Wisconsin, to explore establishing a mission church in Madison for the Reformed folks. Friedli began to meet with the Reformed folks in the home of Salomea Noll to discuss their next steps. In November, 1916, Friedli began gathering some of the Reformed folks for Sunday worship at the Grand Army of the Republic building on the corner of what is now Martin Luther King, Jr. Drive and Doty Street, where the state Justice Department building now stands. The G.A.R. was an organization of Civil War veterans. Their meeting place in the G.A.R. Hall was hardly fancy. They had to go up rickety stairs to the second floor. Friedli taught at Mission House Seminary in the Sheboygan area – the predecessor of what is now Lakeland University. He came back to Madison periodically from Sheboygan over that winter to lead worship. Other Reformed ministers in the area pitched in to help. Then on June 10, 1917, the congregation was formally organized in the G.A.R. Hall with 64 members present. 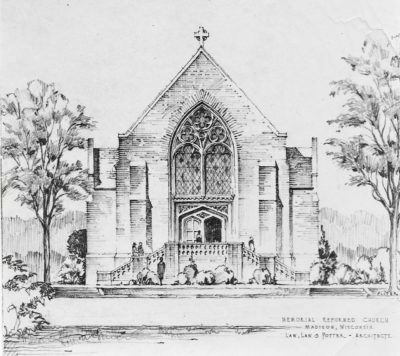 The name “Memorial Reformed Church” was chosen in the hope that people would make memorial contributions to help build a church, recalled Rev. Calvin Zenk. Over time, things did not go so well for the German Presbyterian Church. With the departure of the Memorial crew, by 1919, St. Paul’s had only 9 members on its rolls. The congregation closed and the building was demolished in 1923. Rev. 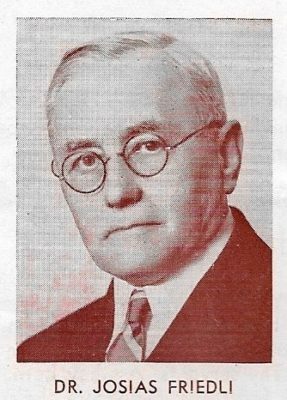 William C. Lehman came from Nashville, Tenn., as a missionary, starting his work as pastor on May 20, 1917. On Aug. 12, the congregation adopted its constitution and charter and on Sept. 30, the congregation voted to purchase a large stone house at 14 W. Johnson Street to serve as its church. The house was remodeled and dedicated on June 9, 1918. In 1921, Rev. Lehmann passed on the leadership to Rev. 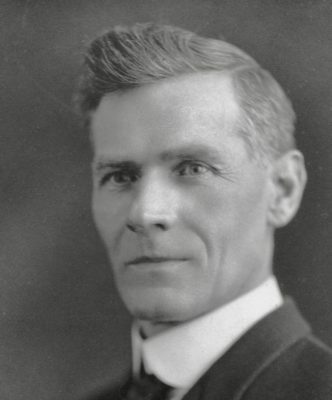 Edwin Vornholt, who came to Madison from the Sheboygan area near Mission House and served as pastor from 1921 to 1928, when he went to serve a congregation in Neilsville, Wis. The basic elements were now all in place for a congregation that would grow and move with the needs of its members and the wider community. Over the past 100 years of the congregation’s history, a number of themes have emerged that help define what Memorial United Church of Christ is in the year 2017. A church on the move – Memorial since its earliest days has been a congregation that has adapted to the needs of its members and the community around it. This has not come without cost and controversy at times, but ultimately, Memorial has always chosen to adapt to its future rather than to get trapped by its past. The dream for Johnson St.
We started in the G.A.R. Hall, a gathering place for Civil War veterans. We moved to a stone residence at 14 W. Johnson St. as our first church. We started to build a new church facility there in 1930, only to have it stalled by the Depression and the congregation wound up worshipping for a dozen years in the basement of what had been the house. When the lack of parking downtown was hampering the life of the congregation, we moved to 1510 Madison St. near the University of Wisconsin Field House, where parking was adequate and we were within easy reach of the students and workers at the university. But as the congregation aged and the nation’s religious currents shifted away from established traditions, Memorial became a congregation in decline. During the 1970s, the congregation struggled with what to do. The number of children in church school dwindled. At the same time, the Southwest Wisconsin Association of the United Church of Christ was looking to start a congregation in Fitchburg. Sandy Henshue had done a lot of investigating the feasibility of starting a new church in Fitchburg and Southwest Association leaders approached the leadership at Memorial about becoming the core of that new congregation. After much discussion, the members voted on Nov. 30, 1986 to begin the process of relocating in Fitchburg. Chuck Schoenwetter made the motion, Ted Peterson seconded and the vote was 60 in favor, 37 against with one abstention. Despite the division, the congregation following the meeting, “celebrated our oneness with communion.” A few families chose not to make the move, but most people began the journey to a new location. 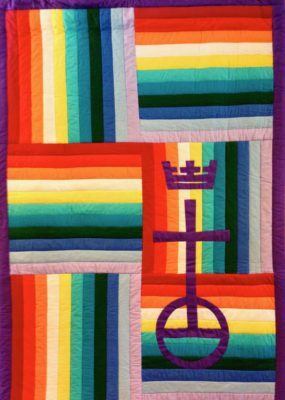 Members at Memorial cut strips of cloth in all the colors of the rainbow, which were dedicated at the last service in the church on Madison Street, stitched together by quilters and then formed the rainbow banner that accompanied the congregation through the transition to Fitchburg. It now hangs in our gathering space. Other churches in the Southwest Association donated money to help with the transition. The Memorial congregation began worshipping at our new church on Feb. 12, 1989. A church that crosses boundaries – We grew out of a Presbyterian church in Madison. When we installed Rev. William Lehman as our first pastor in 1917, we used the Unitarian Church in downtown Madison. When we were building our new church in 1930, we again shared space with the Unitarians. Although our earliest roots were in the Reformed tradition of Christianity, we joined with the German Evangelical denomination in 1931 to form the Evangelical and Reformed Church. Then when the national E-R joined with the Congregational-Christian Church in 1957, we became part of that new denomination known as the United Church of Christ. We have long worked in partnership with other denominations in the Madison area on a wide variety of community projects. When we moved out to Fitchburg, we bought our land from the American Lutheran Church and we shared space in 1987 briefly with the Missouri Synod Lutherans at Christ Memorial Lutheran Church and then through 1988 and early 1989 with the scientists at Nicolet Instruments, setting up a worship space under the beautiful rainbow banner each week. Our old church on Madison Street now serves as the Madison Chinese Christian Church. As we tried to define ourselves as a congregation open to everyone on a faith journey, we began using a statement in 1997 that says: “We welcome persons of all ages, races, sexual orientations and church backgrounds to participate in the life and ministry of our church.” We officially became an Open and Affirming congregation in 2002. We cheered on one of our teens as he transitioned to his identity as a male – and elected him to our church council. In the past decade, we have made connections across racial lines with predominantly African-American congregations like Fountain of Life and Zion City. We have also embraced chances to bring the three great Abrahamic traditions of Judaism, Christianity and Judaism together for conversation and for services on Dec. 21, the longest night of the year. 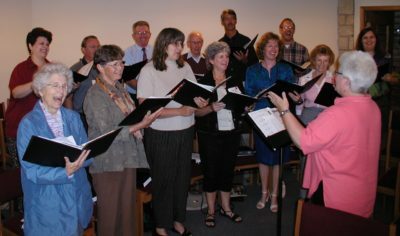 A church where members participate – One of the early slogans of Memorial was “every member a worker” and that has been one of the hallmarks of this congregation. In the 1920s, the Ladies’ Aid Society, the Sewing Circle and the Women’s Missionary Society worked vigorously to raise money to keep the church going. In the 1930s, it was chicken dinners that were open to the public that raised money to pay for the fuel for the building on Johnson Street. There were times in the 1940s where a basket was passed around at church council meetings to raise money to pay the utility bills. In the 1950s and 60s, the Women’s Guild raised money with dinners in order to buy the dishes and silverware that we still use. It was that Women’s Guild that wove together much of the fabric of church life through many tough stretches. That tradition of involvement continued with the move to Fitchburg in the late 1980s as some 80 members donated about 15,000 hours to staining the wooden panels that now fill our church and to cleaning up after the contractors. One of our members, Jim Tetzlaff, made the communion table, lectern, cross and baptismal font as well as the sign out front. As young people began to return to the life of the church, Doug Haynes led the youth in painting the Noah’s Ark mural that graces the education room. People donated sweat equity on our expansion projects in 2001 and 2006 and on remodeling projects in the kitchen and Fellowship Hall. Members host fellowship time; organize garage sales and silent auctions; help out in many ways with worship; create beautiful art pieces for our sanctuary – including art pieces that have involved the whole congregation. The tradition of giving countless hours to the work of the church continues on. A church that reaches out – From its earliest days, Memorial was a church that has gone beyond the needs of its own members. Whether it was reaching out to university students far from home or to people living on the other side of the world, Memorial looked outward. One of the earliest organizations in the church was the Mary Vornholt Missionary Society, started in 1921. 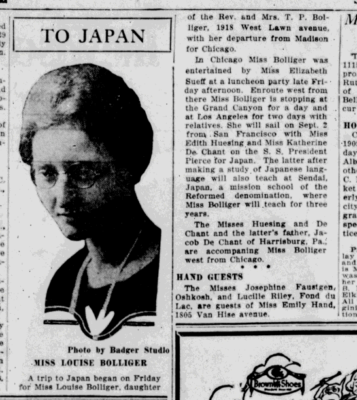 Three young women from Memorial went to Japan as missionaries in the 1920s – Louise and Aurelia Bolliger and Elizabeth Suess – and Louise died in service there. (You can read more about these early missionaries here.) The Women’s Guild in the 1940s and 1950s gave special attention to the Indian missions in northern Wisconsin and helped support Sunburst orphanage in Neilsville. The Sewing Guild made lap robes to help provide warmth at institutions in the Madison area. This impulse to reach out has remained strong over the years, working with Vietnamese immigrant families in the late 1970s and early 1980s, a trip to South Carolina in 1990 to build a Habitat House or work trips to Back Bay Mission in Bilxoi, Mississippi in more recent years. In 2003, we formed a partnership with Christmas Lutheran Church in Bethlehem and sent several delegations to Israel/Palestine. 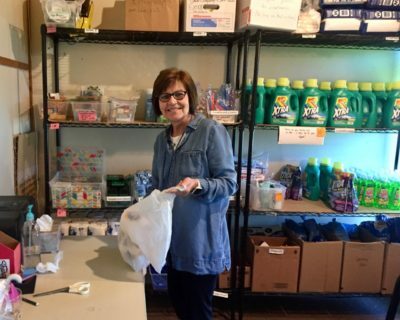 Closer to home, Memorial helped start Madison-area Urban Ministry and the Parental Stress Center in the 1970s, was an original partner in the Community Meal Program at Luke House, was a founding member of Allied Partners on Allied Drive. 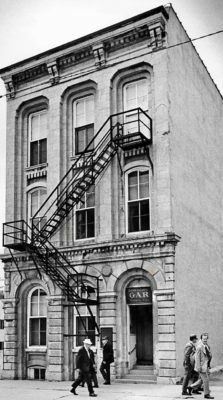 The group that formed what is now Agrace Hospice had its first office in 1978 in the basement of our church on Madison Street. We were among the original partners in the UCC’s Prison Ministry Project. In the past decade, we joined other Fitchburg-area congregations in creating the Good Neighbors Personal Essentials Pantry. We have expanded our connections with groups working both with people who are in jail or prison and with those returning to the community. We have helped connect faith, city and social service leaders in the Fitchburg area and we have had a vital relationship with Domestic Abuse Intervention Services and others working to prevent intimate partner abuse. 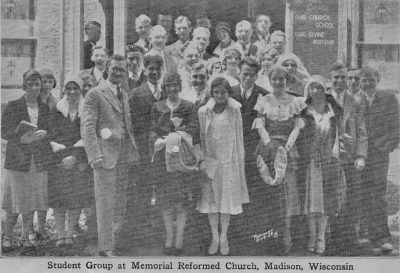 A church for students – Part of the impetus to form Memorial was a desire to serve Swiss Reformed students at the University of Wisconsin. The original church on West Johnson Street was within walking distance of the campus. During the 1920s, university students led the Christian Endeavor Society, which included “social gatherings and devotional meetings” as well as raising money to advertise Memorial among university students. 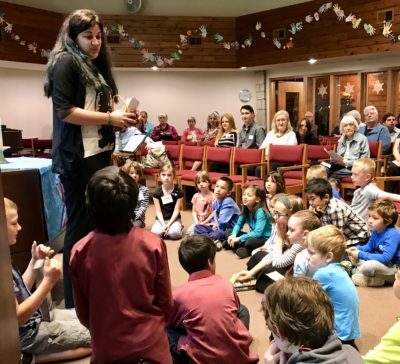 Pastor Calvin Zenk noted in 1930 that in the first 12 years of the church’s existence, “more than 400 young people have been directly connected with its work.” One particular draw was music. In 1930, the students had a mixed choir of 20 voices and a male choir of 12 men, both led by Mrs. E. Marie Zenk, wife of the pastor. When the congregation moved to Madison Street in 1942, university students continued to be part of the life of the congregation, particularly in helping to provide music. In 1948, the United Student Fellowship was formed to provide an expanded campus ministry, with support from both the Wisconsin Congregational Conference and the synods of the Evangelical and Reformed Church. Over time and several changes, that campus ministry has evolved into The Crossing, where members of Memorial are establishing a new connection by helping to serve meals after vespers and sharing the experiences of trips to Israel/Palestine. A church that nurtures ministers – Over the past 90 years, eight members of Memorial UCC – three women and five men — have gone on to serve the wider church as ordained ministers. Ann Blasberg Cordray was ordained in 1949; Lawrence J. and Robert H. Rezash were ordained in 1955; John Tschudy (son of the late John and Helen Tschudy) in 1976; Bill Klossner (son of Loma and the late Albert Klossner) in 1979; Lisa Schoenwetter (daughter of Chuck and Ruth Schoenwetter) in 1986; JungJa Lee-Haynes in 1991; and Dan Schultz (son of Jon and Rheda Schultz) in 1999. In recent years, Memorial has served as a training ground for students on their way to ordained ministry, providing internships to Phil Haslanger, Sara Wilcox and Kristin Gorton. And Memorial member Karin Wells is serving as a chaplain at New Lisbon Correctional Institution and is on a path towards ordination. A church that fosters music – As Memorial formed into a congregation in the 1920s, one of the things that drew university students to the church was the choirs. When Rev. Calvin Zenk arrived as pastor in 1928, his wife also arrived as a strong musical leader for the congregation. She was the organist and the choir director and helped create a sense of musical excellence for the congregation for 21 years. Her piano still serves the congregation in the music room. For a stretch during the 1970s and 1980s, a series of choir directors were from the graduate programs in music at UW and the organists were also UW students. There have been other notable musical moments. When Terry Kiss Frank led the choir both at Madison Street and later in Fitchburg over a period of about 20 years from 1980 to 2000, she not only brought creativity to worship, but also led the choir in the production of a series of musical productions. Paula Haseman brought her talents as a pianist to the congregation from 1989 to 2007, ending her tenure on the day of the 90th anniversary. Merry Spangler was our music director from 2001 to 2015. Noted Madison musician David Lee Crosby, director of the Wisconsin Chamber Orchestra, composed an anthem for the congregation’s move into its Fitchburg church in 1989 and his piano now graces our sanctuary. Now with Jonathan Schroerlucke and the choir, Betsy Robbins and the bells and Mark Sieger and the instrumental group, the tradition of strong music at Memorial lives on. We have had an annual Evening of Music since 2007 that has showcased the incredible range of musical talent in the congregation. And two of our musicians – Adam Dachman and Michael Bryant, composed original pieces for our centennial celebration. A church that raises children – Christian education is a natural concern for any church and from its earliest days, that was certainly true at Memorial. The early days were not always easy. 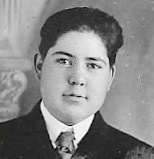 Pastor Calvin Zenk wrote in 1930 that the “Sunday school has not progressed as well as might be expected, probably due to the fact the membership is scattered over the whole city, perhaps due to a lack of adequate equipment.” There were 68 pupils enrolled in Sunday school at that point with 8 teachers. As the church grew, so did the Sunday school enrollment, reaching 225 in 1957. But as the congregation aged and the neighborhood around Madison Street became more of a student residential area, the number of children in the congregation dwindled. There was a point in the early1980s where there was only one child in Sunday school. The move to Fitchburg brought a resurgence of families coming into the congregation. Over the past couple of decades, Lois Rosko, Jann Veloff and now Rebecca Malke have led our education efforts and helped shape the current dynamic religious education program that serves our families – both children and adults. A church that cares for its members – Pastoral care has long been one of the hallmarks of Memorial, but it took a new direction in 1999 when the congregation hired Petra Streiff as its first parish nurse. She served here for seven years until 2006, helping members navigate the health care system, encouraging them to adopt healthy practices and being with them in times of crisis. Mary Ircink joined our staff in 2007 and over a decade built on the foundation created by Petra. But care for one another goes beyond the work of pastors or parish nurses. Memorial has a deep culture of members looking out for each other, celebrating happy moments, walking with people in hard times. 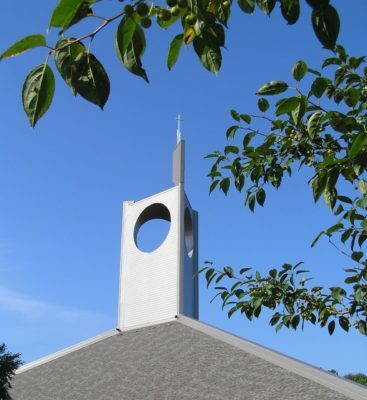 A church that is generous – In celebrating 100 years of existing, Memorial UCC truly is a memorial to all those who have donated of their financial resources and their time and talents to build what we have today. The generosity of people here have enabled us to move through several different buildings to adapt to the needs of the congregation and of the community. There were people who played critical roles in guiding the church through periods of transitions – Albert Taubert, Henry Hefty and Herman Meier in the 1940s and 1950s, Ruth Tiedeman and Henry Ahrnsbrak in the time leading up to the shift from Madison Street to Fitchburg, John and Nancy Hilliard and Ruth and Chuck Schoenwetter and Ted and Marie Peterson as the church struggled with its future in the 1980s. A few people made particularly large donations at critical moments. A bequest from the Dinkler sisters made the construction of the church on Madison Street possible. 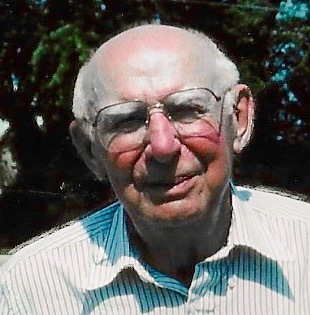 Henry Ahrnsbrak’s bequest to the church has enabled us to send young people to summer camp, to meet the needs of community members in financial difficulties and to create innovative programs. 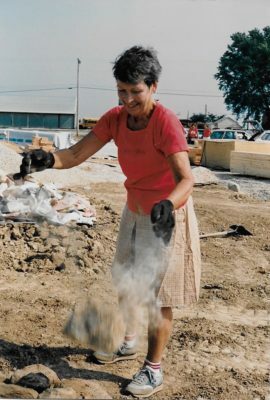 Muriel Taubert’s bequest enabled us to pay off our mortgage in 2004 on our first expansion in Fitchburg and the congregation’s strong response to three capital campaigns in the last 20 years have enabled us to expand and update our building. Then this year as part of our centennial celebration, we raised $10,000 for our Centennial Outreach Fund to help Madison-area Urban Ministry ramp up its microloan program for people who were formerly incarcerated. We have also done major fund-raising campaigns to help the Road Home Dane County and Domestic Abuse Intervention Services and our UCC camps in Wisconsin. Ongoing contributions to the Pastor’s Discretionary Fund enables us to help individuals facing financial crises in their lives. A building that reflects our theology —When architect Helmut Ajango set out to design a new church for Memorial, he asked members to write down their sense of what the church should represent. What emerged was a church that reflects the Trinity. The building has three sections – one for worship, one for education and one for the social life of the congregation. The windows in the sanctuary look out into the world as the three circular skylights open us up to God as they bring in the light from above. The tower has three sides with a circle on each side with three crosses on the top, reflecting the three crosses on Calvary where Jesus died. The land on which the church rests is the terminal moraine, the area where the glaciers stopped. Over the years, the people who care for our building and grounds have worked to make the church and its grounds an environmentally-friendly place as we work to protect the gift of creation. Here’s where we are 100 years after people started climbing those rickety stairs. We have about 200 people who are members of this congregation, another 30 or so who are regulars around here. About 130 people join us for worship each Sunday and regularly about 25 of those are children who add energy to the present and hope for the future. We continue to reach out with generosity to the community around us. And we look out for each other in so many ways. We are a community of faith called by God, to gather for worship and reach out in ever-widening circles as a witness to God’s all-inclusive love in Jesus Christ, and to act out God’s grace and mercy in deeds of teaching, healing, reconciling, nurturing, and feeding those who are hungry in body or in spirit. This history was compiled using the amazing work of the late Loma Klossner in maintaining Memorial’s archives and in creating a collection of some of the critical texts in the church’s history. Pastor Phil Haslanger organized the information and wrote this booklet.